Knitted Clothing Fabric Div. : Takisada-Nagoya Co., Ltd. The Knitted Clothing Fabric Division performs planning, provides solutions, and carries out sales of jersey materials with constant value and freshness from raw materials that are targeted at women across a wide range of age groups from young to misses regardless of whether for the Japanese or overseas market. While mainly focusing on high-quality materials produced in Japan, the Division also features a wide-ranging line-up of highly refined European materials and cost-competitive materials from ASEAN countries. We handle everything from natural materials such as cotton and wool, to synthetic fiber materials such as Tencel and triacetate. Our product development pursues excellent wear comfort and functionality. 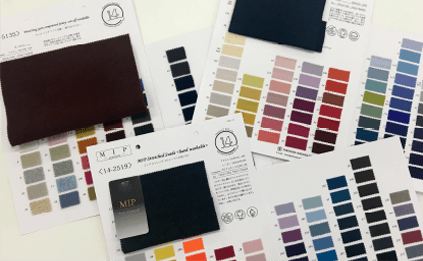 By applying high standards for selected raw materials, and working closely with experts in areas of spinning, knitting, dyeing, and finishing from within Japan and abroad, we are able to produce a great amount of extremely original products with high added value. One great feature is that we constantly stock wide-ranging materials and colors at our own risk in order to establish a supply system that provides the right product at the right time to satisfy all of our customers’ needs. In response to the extreme changes of the ladies market, we constantly work out new plans for each season to provide our customers with fresh solutions. Our goal in the future is to further strengthen the development and sales of products sold in markets outside of Japan. 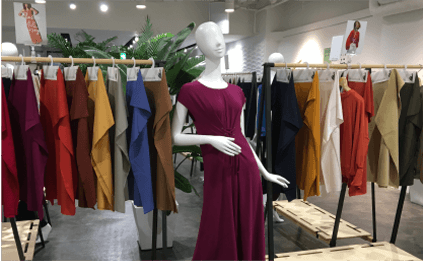 Our future strategies consist of increasing our knowledge of raw materials, knitting, and dyeing in order to develop original products each imbued with our own ideas.